The legend is here, and gives detailed information about the central figures. 1) Padmasambhava (གུ་རུ་རིན་པོ་ཆེ།) is said to have transmitted Vajrayana Buddhism to Tibet, Bhutan and neighboring countries in the 8th century AD. In those lands, he is better known as Guru Rinpoche (lit. “Precious Guru”) or Lopon Rinpoche,or as Padum in Tibet, where followers of the Nyingma school regard him as the second Buddha. 2) Shantarakshita (Kenjen Shewatso Tib. ཞི་བ་འཚོ་), also called Khenpo Bodhisattva, ‘Bodhisattva Abbot’. This great Indian pandita of the Mahayana school was abbot of the Buddhist university of Nalanda. He was invited to Tibet by King Trisong Detsen where he founded the temple and monastery of Samyé and ordained the first seven Tibetan monks, thus establishing the Tibetan Sangha, according to Nagarjuna’s Sarvastivadin tradition. 3) King Trisong Detsen (Tib. ཁྲི་སྲོང་ལྡེ་བཙན་ or Trisong Deutsen [Déu tsen] (ཁྲི་སྲོང་ལྡེའུ་བཙན་) (742-c.800/755-797 according to the Chinese sources) – the thirty-eighth king of Tibet, second of the three great religious kings and one of the main disciples of Guru Rinpoche. It was due to his efforts that the great masters Shantarakshita and Guru Padmasambhava came from India and established Buddhism firmly in Tibet. 4) Green Tara (Tib. སྒྲོལ་མ, Drolma) or Ārya Tārā, also known as Jetsun in Tibetan Buddhism, is a female Bodhisattva in Mahayana Buddhism who appears as a female Buddha in Vajrayana Buddhism. She is known as the “mother of liberation”, and represents the virtues of success in work and achievements. 5) Nagarjuna (Tib. ཀླུ་སྒྲུབ་, Ludup Nagarjuna) – one of the six great commentators on the Buddha’s teachings, the great scholar Nagarjuna (c.150-250) is revered as an unsurpassed master by all Buddhist schools. His teachings provide the foundation for the Madhyamika School, which propounds the ‘Middle Way’ philosophy, accepted as the highest view within the sutrayana. He was also the revealer of the Prajñaparamita Sutras, the core teaching of the second turning of the wheel of the Dharma. He is also counted among the eighty-four mahasiddhas, and among the eight vidyadharas. 6) Aryadeva (Tib. འཕགས་པ་ལྷ་, Pakpa Lha) one of the six great commentators on the Buddha‘s teachings. He was a disciple of Nagarjuna and devoted his life to continuing his master’s work, consolidating the Madhyamika tradition. He is also counted among the eighty-four mahasiddhas. 7) Asanga (Tib. ཐོགས་མེད་, Thok Meh) — one of the most famous Indian saints, he lived in the fourth century and was the elder brother of Vasubandhu. He received teachings from Maitreya and transcribed them as the ‘Five Treatises of Maitreya’. Together with Asanga’s own commentaries, these texts became the basis for the philosophical schools known as Yogachara, or Chittamatra. 8) White Tara (Tib. སྒྲོལ་དཀར་, Drolkar) — manifestations of Tara, white in colour. 9) Marpa Lotsawa (Tib. མར་པ་ལོ་ཙཱ་བ་ཆོས་ཀྱི་བློ་གྲོས་) (1012-1097) was a great Tibetan master and translator, and a disciple of Naropa and other great siddhas. He brought many tantras from India to Tibet and translated them. These teachings were passed down through Milarepa and his other disciples, and are the basis of the teachings of the Kagyü lineage. 10) Milarepa (Tib. རྗེ་བཙུན་མི་ལ་རས་པ ) (1040-1123) is considered to be the founder of the Kagyü school of Tibetan Buddhism. His life story is one of the most popular and enduring narratives in Tibetan culture. 11) Gampopa Sonam Rinchen (Tib. སྒམ་པོ་པ་བསོད་ནམས་རིན་ཆེན) (1079–1153) established the Kagyu school, one of the four major schools of Tibetan Buddhism today, as an institution. 12) Choklang Dignaga (Skt. Dignāga; Tib. ཕྱོགས་ཀྱི་གླང་པོ་) (circa 6th century AD) was one of the six great commentators on the Buddha’s teachings. He was one of the four great disciples of Vasubandhu who each surpassed their teacher in a particular field. Dignaga was more learned than Vasubandhu in pramāṇa. His reputation as unequalled in debate was cemented through his celebrated victory over the brahmin named Sudurjaya at Nālandā monastery. Among his disciples was Iśvarasena, who later became the teacher of Dharmakīrti. 13) Yonten Weuh Gunaprabha (Tib. ཡོན་ཏན་འོད་) an Indian master of the Vinaya tradition born in the seventh century and a disciple of Vasubandhu. According to one tradition, he is considered as one of the ‘Two Supreme Ones’—great commentators on the Buddha’s teachings. 14) Bhāvaviveka (Tib. ལེགས་ལྡན་འབྱེད་) (c.500-570), was a sixth century master of the Svatantrika school of Madhyamika. 15) Buddhapalita (Skt. Buddhapālita; Tib. སངས་རྒྱས་བསྐྱངས་) – the great Indian scholar who is acknowledged as the founder of the Prasangika Madhyamika. He composed a commentary to Nagarjuna‘s Mulamadhyamaka-karika, known simply as the Mūlamadhyamakavṛtti, or the ‘Buddhapalita’ commentary. 16) Chandrakirti (Tib. ཟླ་བ་གྲགས་པ་, Dawa Drakpa) — a renowned Indian scholar who was born in the early seventh century. He is the author of Introduction to the Middle Way, Clear Words, and other key works of the Prasangika Madhyamika. 17) Shantideva (Tib. ཞི་བ་ལྷ་, Shiwa Lha) (c.685-763) — a great master, scholar, and bodhisattva, who was the author of the Bodhicharyavatara. He also wrote the Shikshasamucchaya and the Sutrasamucchaya. Under the name of Bhusuku he is listed among the eighty-four mahasiddhas. 18) Atisha Dipamkara Shrijñana (Tib., ཇོ་བོ་རྗེ་དཔལ་ལྡན་ཨ་ཏི་ཤ) Atisha Marmézé Pal Yeshé) (982-1054) was a great Indian master and scholar, and author of many texts including the Lamp for the Path of Awakening. One of the main teachers at the famous university of Vikramashila, he was also a strict follower of the monastic rule and was widely acclaimed for the purity of his teaching. He spent the last ten years of his life in Tibet, teaching and translating texts, and was instrumental in reinvigorating Buddhism there after a period of persecution. His disciples founded the Kadampa school. 19) Shariputra (Tib. ཤ་རིའི་བུ, sha ri’i bu) — one of the foremost shravaka disciples of Buddha Shakyamuni. 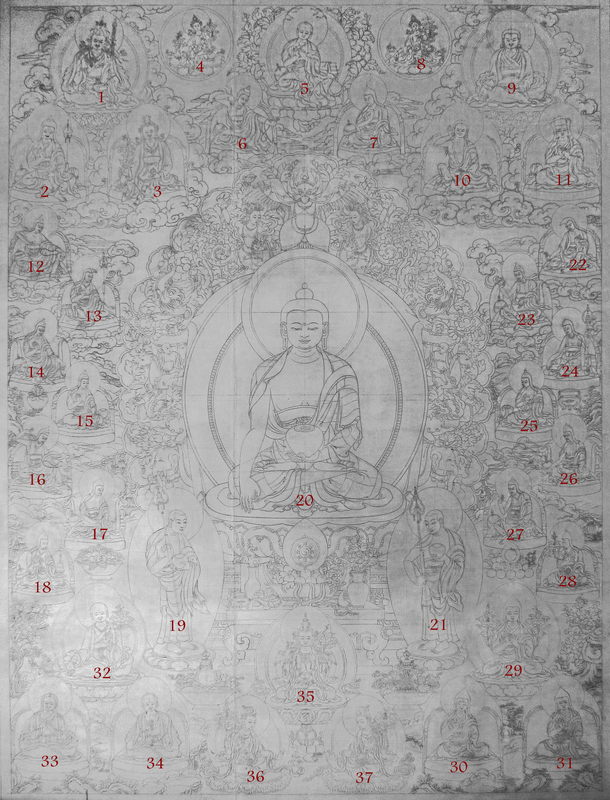 20) Buddha Shakyamuni (Tib. སངས་རྒྱས་ཤཱཀྱ་ཐུབ་པ་) — the Indian prince Gautama Siddhartha, who reached enlightenment (and thus became a buddha) in the sixth century B.C., and who taught the spiritual path followed by millions all over the world, known today as Buddhism. 21) Maudgalyāyana (Tib. མོའུ་འགལ་བུ།) was one of the Śākyamuni Buddha‘s closest disciples. A contemporary of famous arhats such as Subhūti, Śāriputra, and Mahākāśyapa, he is considered the second of the Buddha’s two foremost disciples (foremost in supernatural powers), together with Śāriputra. He was born in a Brahmin family of Kolita. 22) Vasubandhu (Tib. དབྱིག་གཉེན་, Yiknyen) numbers among the ‘Six Ornaments’, the greatest Buddhist authorities of Ancient India. He was the younger brother of Asanga, and composed The Treasury of Abhidharma, a complete and systematic account of the Abhidharma, the peak of scholarship in the Fundamental Vehicle. Later he followed the Mahayana Yogachara view, and wrote many works, such as Thirty Stanzas on the Mind. 23) Choedak Dharmakirti (Tib. ཆོས་ཀྱི་གྲགས་པ་, Chökyi Drakpa) (7th Century) was born to a bramhin family in the South of India. After receiving a bramhanical education, he later became interested in the Buddhist teachings. He then travelled to Nalanda in order to receive teachings from a direct disciple of Vasubandhu. Dharmapāla was still living—Dharmakirti received ordination from him—but Dignaga had passed away. Instead he received instruction from Ishvarasena, who was Dignaga’s direct disciple. Having entirely comprehended Dignaga’s oeuvre, he became perhaps the greatest master of pramana and went on to compose the ‘Seven Treatises on Valid Cognition‘. 24) Shakyaprabha (Tib. ཤཱཀྱ་འོད་, Shakya Ö) (b. 8th centunry) — one of the ‘Two Supreme Ones’—great commentators on the Buddha’s teachings—he was a disciple of Shantarakshita, and was a crucial link in the Vinaya tradition of which the lineage is still extant in Tibet. 25) Haribhadra (Tib. སེང་གེ་བཟང་པོ་, Senge Zangpo) (late 8th C.) was a great pandita and master of the prajnaparamita teachings. He received instructions directly from Maitreya and composed the Sphutartha, which is the most celebrated commentary on Maitreya’s Abhisamayalankara. Taranatha says he was a disciple of Shantarakshita. He was a teacher of Buddhajñanapada. 26) Arya Vimuktisena (Tib. འཕགས་པ་རྣམ་གྲོལ་སྡེ་, Pakpa Namdroldé) (6th C.) is the author of the earliest commentary on the Abhisamayalankara, which relates it to the text of the Perfection of Wisdom Sutra in Twenty-five Thousand Lines. 27) Kamalashila (Tib. པདྨའི་ངང་ཚུལ་, Pemé Ngang Tsul) (c. 740-795) — this master was the main disciple of the great abbot Shantarakshita. He famously defeated a Chinese master of the Hashang school (whose personal name is sometimes given as Mahayana Hashang) in the great debate at Samyé, which took place around 792 AD, thereby ensuring that the Tibetans followed the Indian tradition of Madhyamika which had flourished at the great Nalanda Monastery. He died in Tibet in around 795. 29) Tsongkhapa Lobzang Drakpa (Tib. ཙོང་ཁ་པ་བློ་བཟང་གྲགས་པ་, tsong kha pa blo bzang grags pa) (1357-1419) — the founder of the Gelug school. As a young man he distinguished himself through his study and his intellect. The last thirty years of his life were dedicated to teaching, writing, founding monasteries and other activities that greatly contributed to the revitalization of Buddhism in Tibet. 30) Gyaltsab Je (Tib. རྒྱལ་ཚབ་རྗེ་, Rgyal tshab rje) (1364–1432) or more elaborately, Gyaltsab Dharma Rinchen was born in the Tsang province of central Tibet. He was a famous student of Je Tsongkhapa, and actually became the first Ganden Tripa (throne holder) of the Gelug tradition after Je Tsongkhapa’s death. Gyaltsab Je was a prolific writer; one of his most famous texts is a commentary on A Guide to the Bodhisattva’s Way Of Life. 31) Khedrup Gelek Pelzang (Tib. མཁས་གྲུབ་རྗེ་)(1385–1438 CE) – better known as Khedrup Je – is considered the First Panchen Lama. Khedrub Je was one of the main disciples of Je Tsongkhapa (whose reforms to the Kadam tradition of Atisha are considered the beginnings of the Gelug school of Tibetan Buddhism). Khedrub Je is considered to be an emanation of Manjushri, the Buddha of Wisdom. 32) Sachen Kunga Nyingpo (Tib. ས་ཆེན་ཀུན་དགའ་སྙིང་པོ་, Sa-chen Kun-dga’ Snying-po) (1092–1158) was a Tibetan spiritual leader and the first of the Five Venerable Supreme Sakya Masters of Tibet. Sachen Kunga Nyinpo was the 3rd Sakya Trizin and son of Khon Konchok Gyalpo (1034–1102) who was the first Sakya Trizin and founder of the first Sakya Monastery in Tibet in 1073. 33) Sonam Tsemo (Tib. : bsod nams rtse mo; 1142–1182) (or Lobpon Sonam Tsemo), an important Tibetan sprititual leader and Buddhist scholar, was the second of the so-called Five Venerable Supreme Sakya Masters of Tibet, the founding fathers of the Sakya-tradition. 34) Jetsun Dragpa Gyaltsen (Tib. རྗེ་བཙུན་གྲགས་པ་རྒྱལ་མཚན་) , the third of the five founders of the Sakya Order, was born in the year of the Female Fire Rabbit, (1147) in Sakya, Tibet. 35) Avalokiteśvara is known as Chenrezig, སྤྱན་རས་གཟིགས་ and is said to be incarnated as the Dalai Lama,the Karmapaand other high lamas. 37) Vajrapāṇi (Tib. ཕྱག་ན་རྡོ་རྗེ་) is one of the earliest bodhisattvas of Mahayana Buddhism. He is the protector and guide of the Buddha, and rose to symbolize the Buddha’s power. « Great new goodies in our gift shop!